I really enjoyed this book. It isn't the sort of thing I usually review but I've just started teaching Geography to a reasonably bottom set Year 7 class and I thought this would be handy. It has nice double page spreads on different animals you've probably not heard of because they aren't so well known. The animals included are fascinating with lovely pictures and nice facts about them. 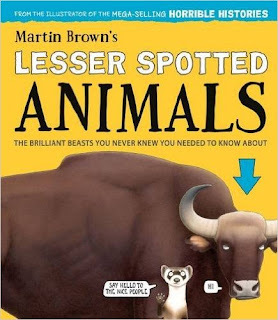 It is definitely the sort of facts I could use introduce more unusual animals to my class when teaching about different habitats across the globe. The only thing I would change about it is that I would have liked a photograph of each animal too.